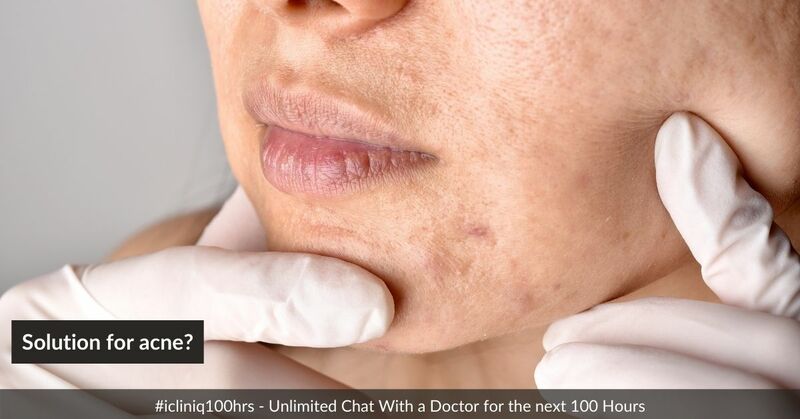 iCliniq › Ask a doctor online › Answers › Cosmetology › Acne › Without medicine or gel, how to get a permanent solution for acne? Q. Without medicine or gel, how to get a permanent solution for acne? Answered by Dr. Rashmi Singh and medically reviewed by iCliniq medical review team. I am a 23 year old male. My problem is acne. I am getting red whitehead with pus. I was taking Isotretinoin 20 mg for 1.6 years. When I was on Isotretinoin, I did not get even a single acne. After two weeks of stopping Isotretinoin, I had a sudden breakout. My skin is very oily, and I do not apply any moisturizer or any makeup. I am using Neutrogena face wash and taking healthy diet. I do not eat any junk food too. I am also applying Zinderm BPO gel for acne. I want a permanent solution for my acne without medicine or gel. Please help me. First of all, if you have an acne prone skin, then it is impossible to have a clear skin without any topical and oral intervention. Since you have taken more than a year of Isotretinoin 20 mg daily, I would not advise repeating that at the moment. I suggest you Doxy 100 mg (Doxycycline) twice a day and tablet Zitcare (Zinc) 200 mg once a day for 15 days and if you do not have any gastric issues with that, then 200 mg twice a day post that. Apart from that apply Tretinoin gel 0.04% at night in a very thin film, and Dapsone gel under sunscreen in the morning to prevent further pimples. You can also consult a dermatologist for salicylic peels which will bring down the intensity of acne. Avoid milk-based products for a while, and decrease sugar intake. Let us know in one month about the improvement you can see. I had CO2 fractional laser before. I had 10 sitting for my open pores, which is on the cheeks and nose, but there is no improvement. Does salicylic acid peel work for acne? How many sitting can I take? What should be the interval of each sitting? My tongue is white, patchy and the lateral border is black. I do not have the exact reason for this. Does it due to the medicine? Which medicine will be more effective for acne? Salicylic peels help in better exfoliation in order to decrease the onset of new acne. One peel in every three weeks for at least five to six sessions is a must. Can you please attach a picture of your tongue so that we can determine the cause of it? How long have you taken Zathrin (Azithromycin)? Any Zinc 100 mg tablets available can help acne with minimal side effects. Other than laser, is there a way to treat acne marks?